Do You have a teenage girl who is just discovering her own style? Then you’ll love teen girls bedroom design ideas we found. Anything from fashion to personal space, girls will choose clothing, accessories and decor that reflects their favorite color schemes, personalities, interests and hobbies. Your little girls is coming to her own. Her own style, mind, opinion that is. Maybe it’s time to give her some freedoms to express herself within her personal space. You can learn a lot about her personality and style by letting her design her own. Can you remember what it was like when you were a teenager? What did your room look like? What colors were your favorites? Were you involved in sports and displayed all your metals, framed uniforms and other items. Were your walls covered with posters of your favorite Bands, Artists or Famous People, or did you put up pictures of your BFF’s? Teenagers love to express themselves. The bedroom is a personal space where you will see your little girls creativity and personality come to light. How about helping her with some fun Craft Projects to revamp that bedroom? You could turn this into a fun and quality time with your daughter. Connect with her through DIY Projects. Let her choose a project and take her shopping for supplies. Here are some amazing and fun DIY Projects to start with. Teen girls bedroom wall decor in complementary colors brightens the room. A decor that can be easily exchanged as the tasted evolved. One of many cool teenage girl bedroom ideas is to personalize her space with her name, style and colors like here. A fresh and fun look for a young girls bedroom. 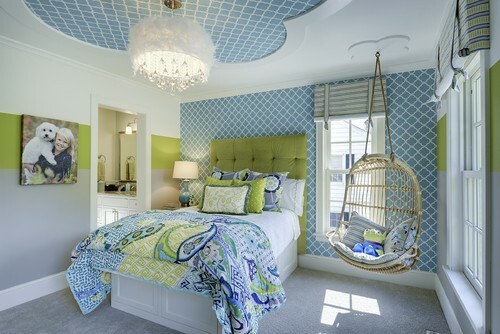 Photo by CHATHAM INTERIORS, INC.
Shopping for teenage bedroom furniture for girls? I know from experience they love to feel special and this tufted cozy bed sure would do that. This one spells spoiled all the way. 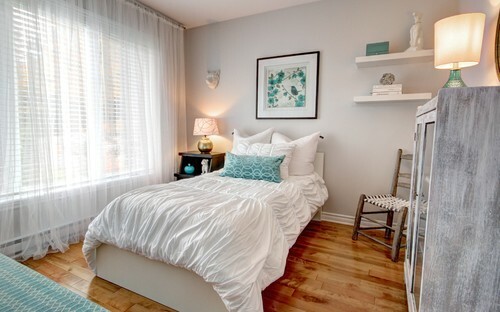 Teenage bedrooms for girls should include a seating area to hang with friends or read a book. If she’s more into Fashion and Glamour this is a great way to inspire her Style. If I was a teen again, this would be it. Light and bold colors and tufted furniture. There is something royal and classy about tufted stuff. Gorgeous Girl Teen Bedroom. Photo by The Consulting House Inc. I hope you enjoyed getting Ideas from these Teen Girls Bedroom Designs just like I did 🙂 Happy Designing!